The power system looks good, 12" prop on 4s is good. Ecalc is a good method to check everything out and then a watt meter when you put it together to double check. 60 amp ESC for a 40 amp draw is good. 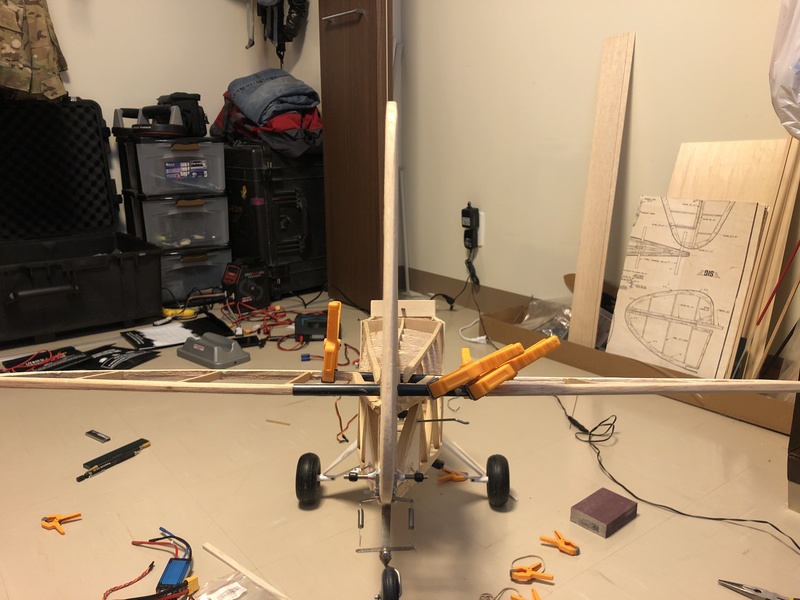 Any advice on how to go about centering the motor on the firewall, there’s no real clear location for the prop line watermark. 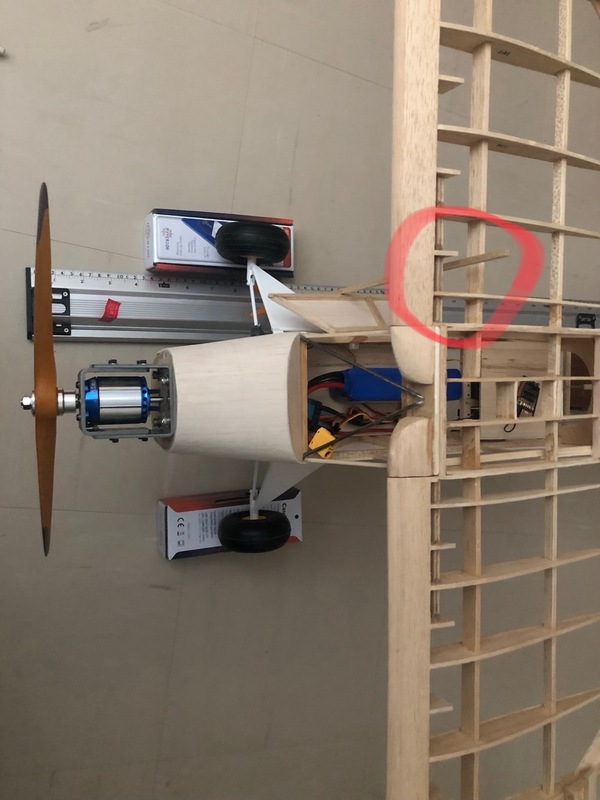 I do see the thrust line angle but I’m trying to determine if that’s also the waterline mark for the center of the prop shaft? It depends on if you have any right thrust or not. There is geometry equations or if no right thrust just center it and call it good. 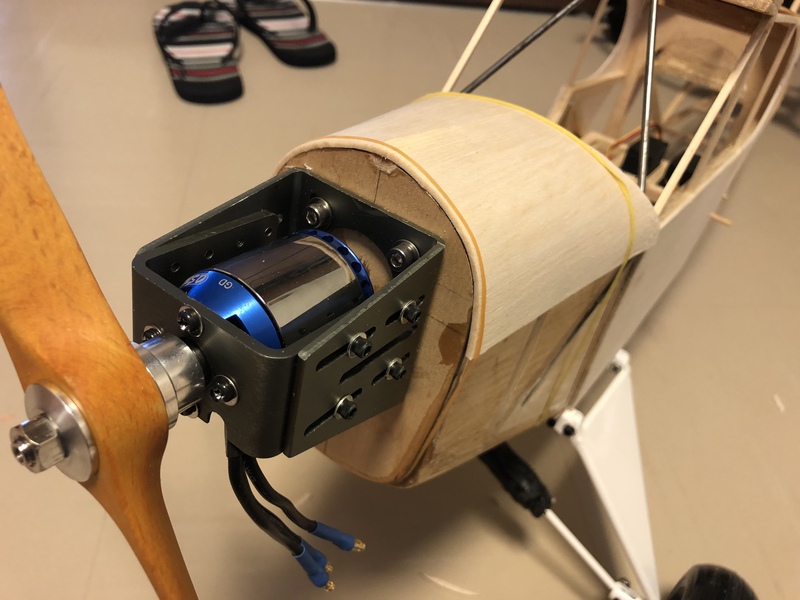 On some designs the motor will sit off center to compensate for left or right thrust. 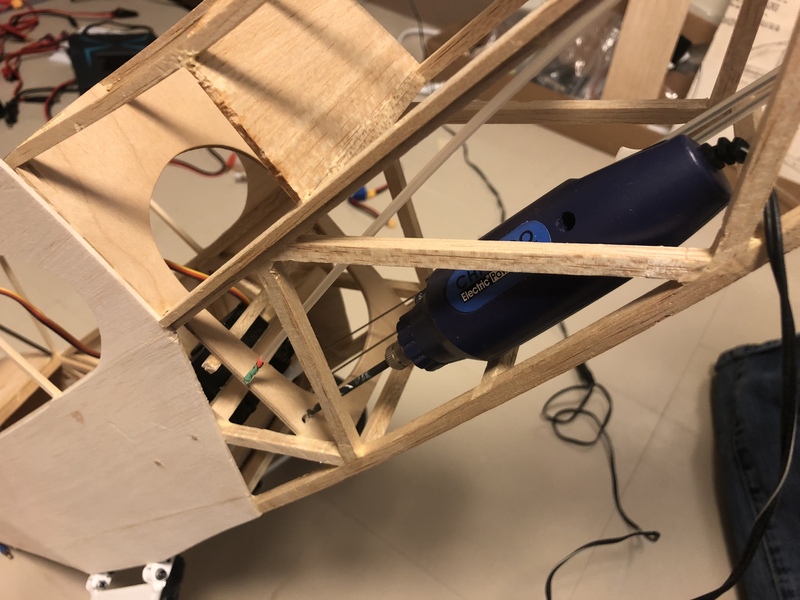 The prop will align with the center of fuse depending on thrust angle. It’s hard for my brain to think that much so I always hope the kit has it figured out for me, but I do understand the theory. 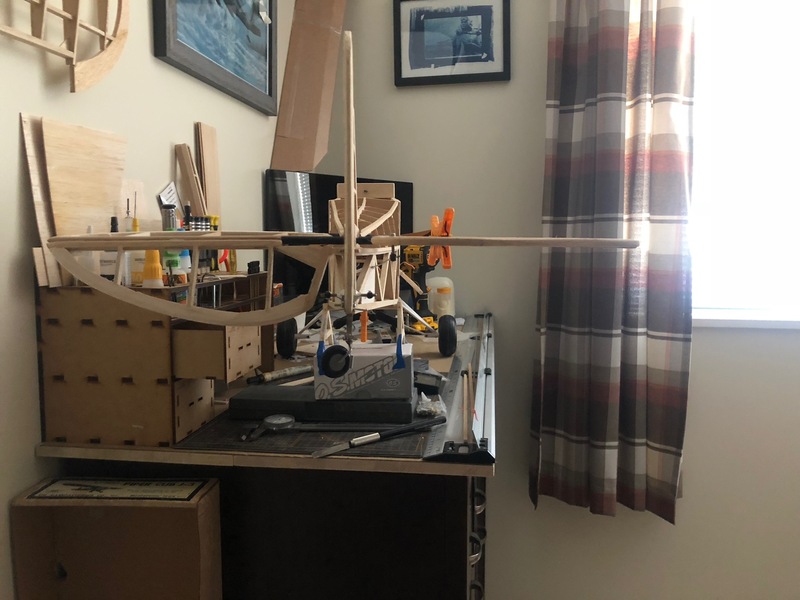 Yeah I understand left turning tendencies and thrust line I’m fairly confident I have that worked out, I’m more trying to figure out the waterline position, (vertical location) on the firewall. That's an interesting question. I would check out some other plans and see what the average placement is for similar aircraft and go with that. I know that a certain amount of downthrust 1-2 deg is preferable for some airplanes, but that can be experimented with using washers. If your plans have everything worked out for gas, use the same for electric as it works the same. Yeup, I have three sets of plans, the originals, the version sig currently sends out, and the float plane plans, and between the three I think I have positioning down, there’s a couple of center lines and in one view there’s an angle for down thrust and on another plan there’s a small amount of right thrust, I kind of laid the firewall over all three sets of plans separately and drew all the lines on it and where they intersect is what I’m going for. 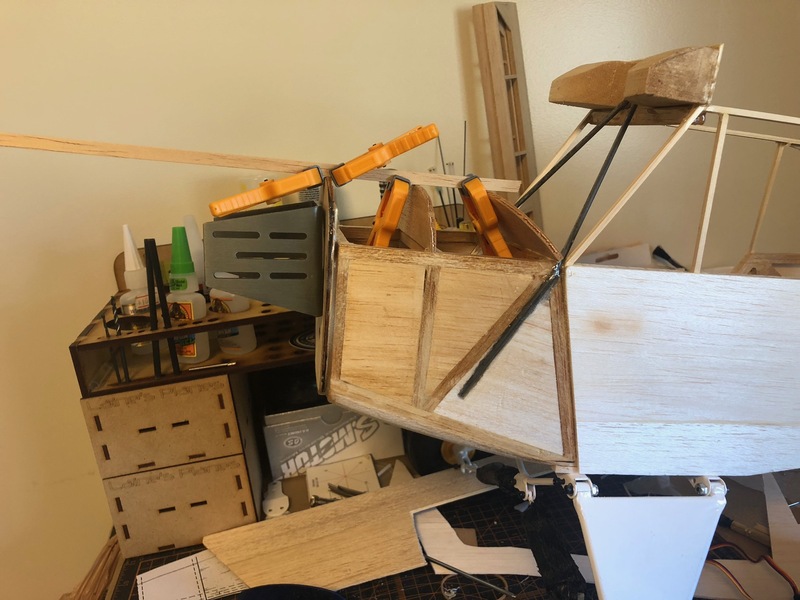 I was able to mock it up on a temporary firewall, it’s gonna need some shimming and I need to build a mount to move the motor closer to where the prop shaft will exit the nose cowling but this with a battery allowed me to see what CG is going to look like. And will help me determine servo mounting locations etc. 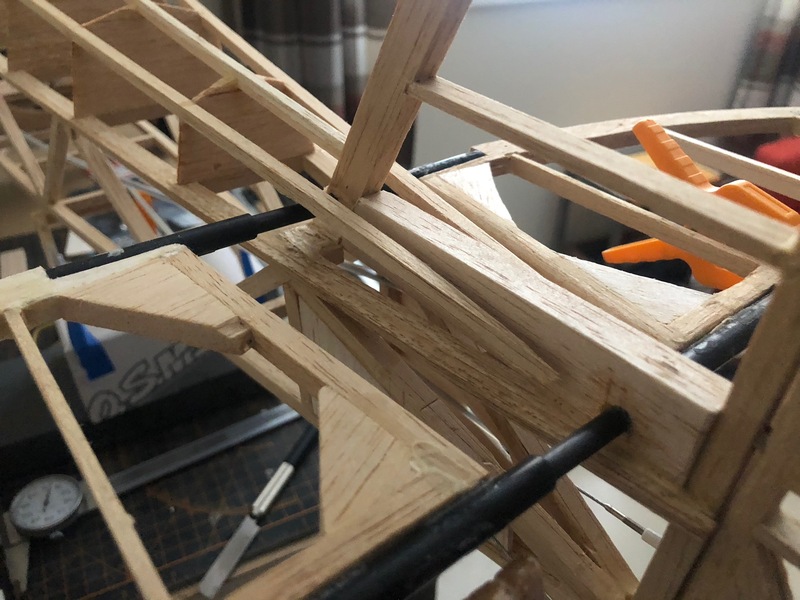 My rudimentary balance on a stick approach to CG.... you can see the stick just aft of the forward float/landing gear mount. 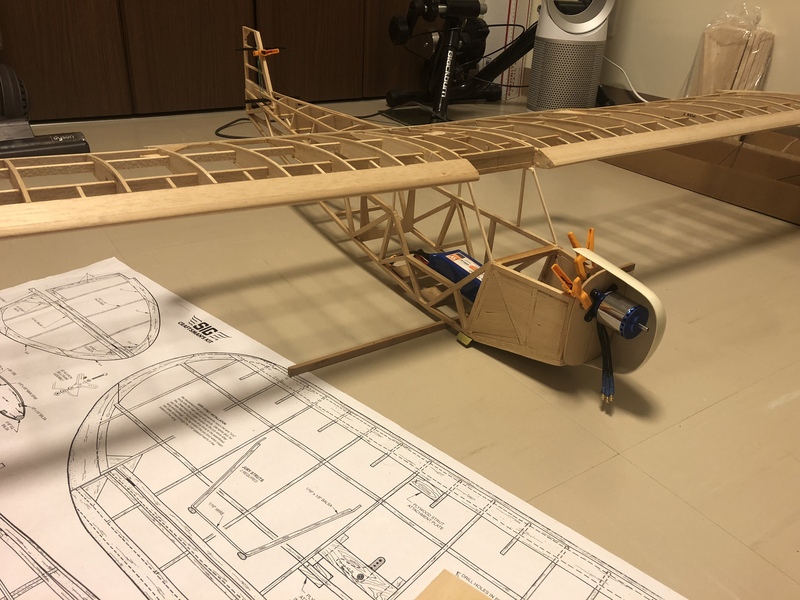 lol once I get landing gear on, I’ll actually level the aircraft and weight it, so I can get an accurate arm and moment, I’ll be able to calculate CG more accurately and thus should help when I start putting the floats together. 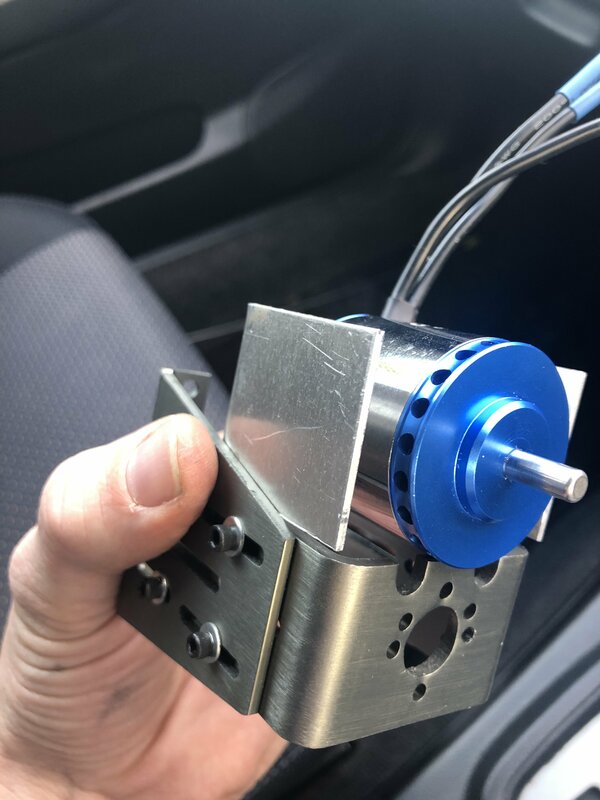 There are some pretty cool motor standoffs out there now too for electric motor mounting. 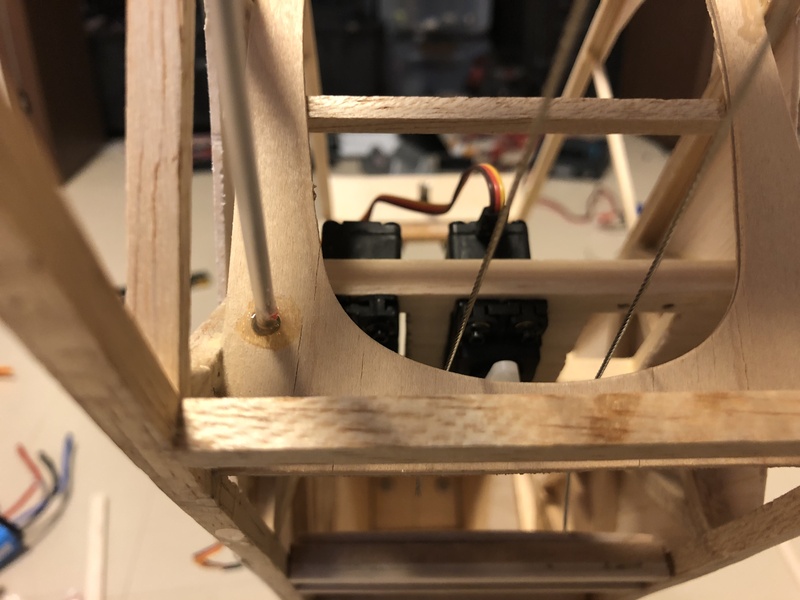 I have been using the Electriflight/Great Planes motor mounts and like them too. Or, just build your own box like some do, so many options for the same solution, fun stuff. Still here and still at it, I imagine it’s been a busy holiday season for everyone. We had more guests for thanksgiving so again my space had to be given up for the guest bedroom! 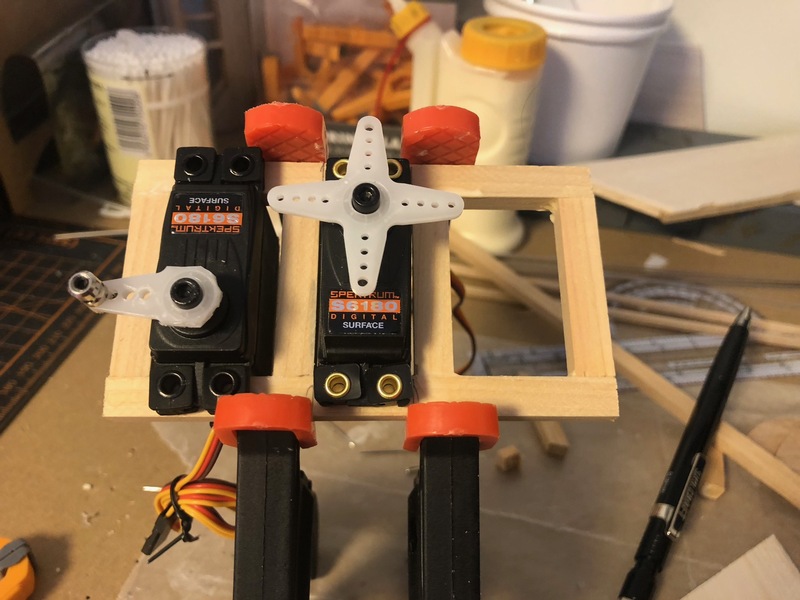 But I suppose that’s alright it gave me time to assemble a bunch of miscelaneous parts and pieces that I didn’t have and finalize details on other things like servos and such. 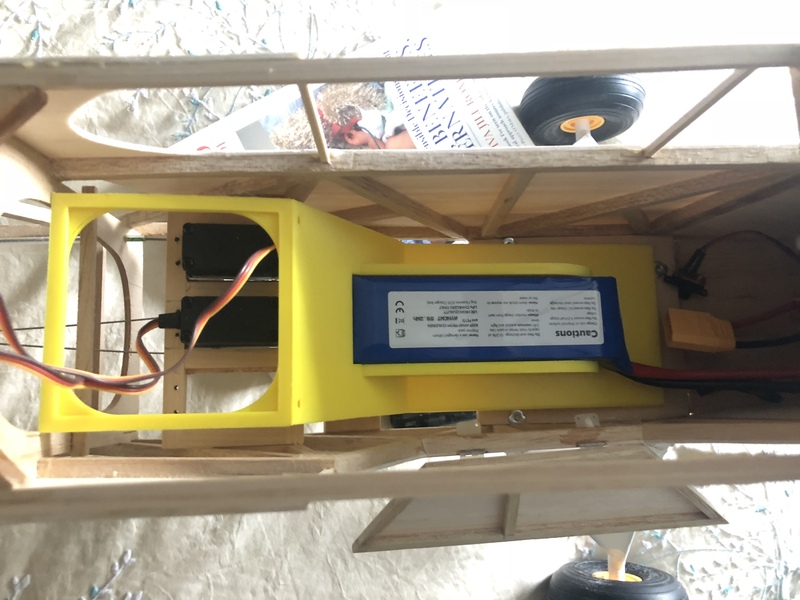 I got the plane out and started playing with electronics and landing gear. 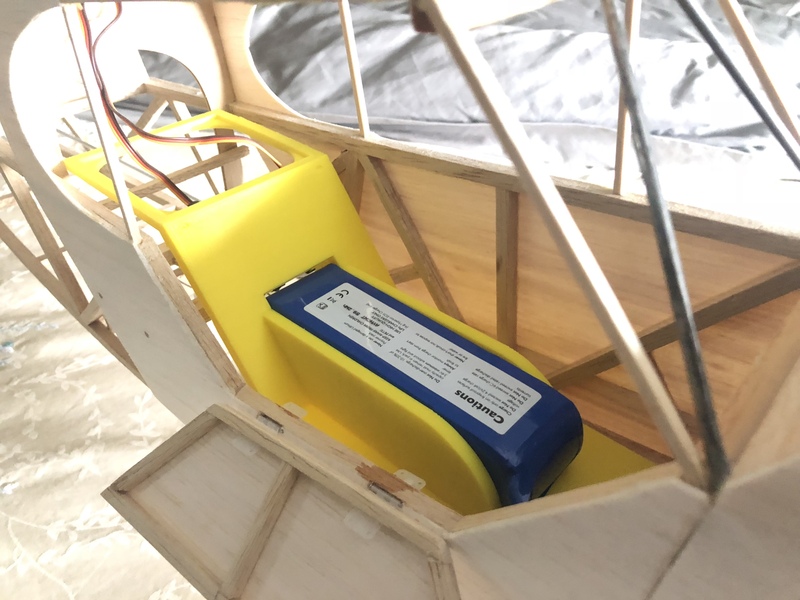 For the gear I purchased the eflite super cub landing gear, I’m a little apprehensive about soldering the wire and wanted to go with something that is easily removed for floats. The fit is almost perfect, it seems maybe slightly larger than Scale but with sheeting on the sides it really fits well. The strut attach fittings however leave a bit to be desired and will likely not make it in the final model. 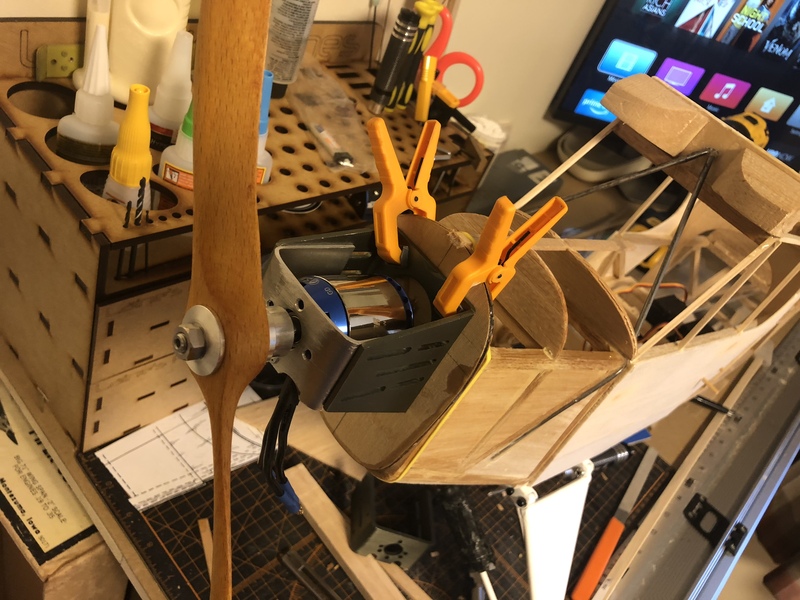 I ran the motor a bit today for fun, and I think this is going to be a good match, I had a 13” prop and I may end up using it in place of the 12. 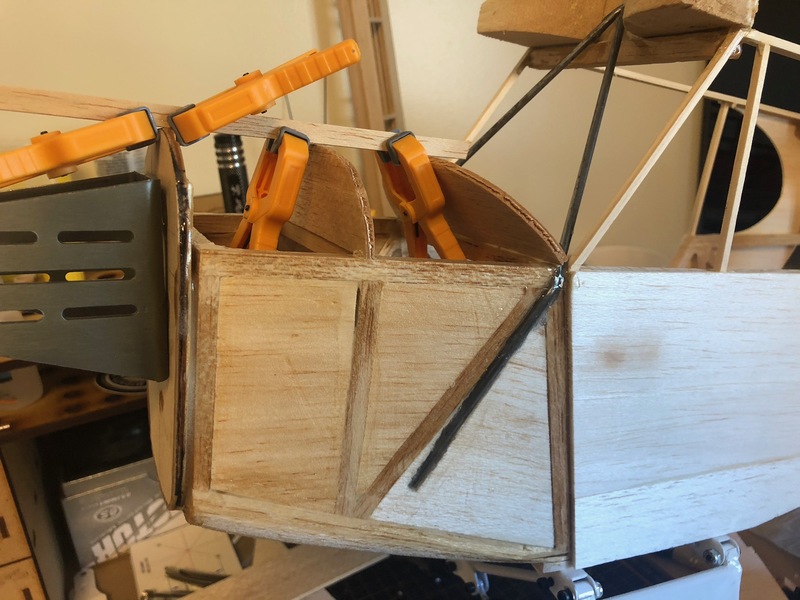 I had initially epoxied in the landing gear blocks based on a combination of Float Plane Drawings, and the Original Drawings utilizing the wire gear. 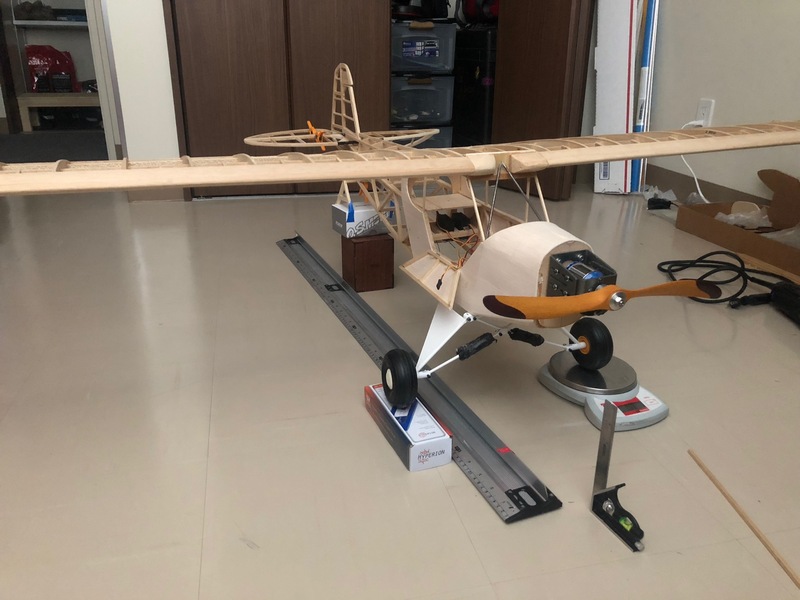 However, I purchased a set of landing gear from the e-flight supercub which are pretty close to scale for the 1/6 J3. 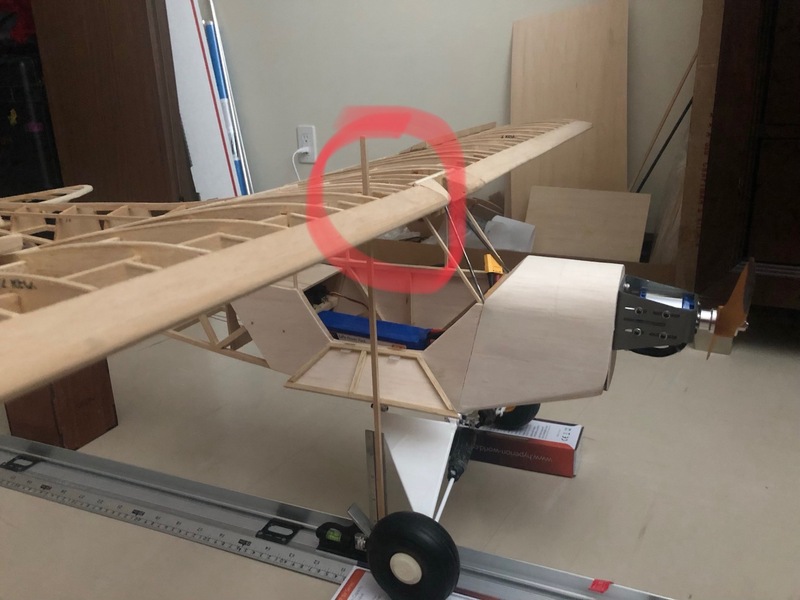 So what would have worked for the wire landing gear will not work for the landing gear I bought. I could have made it work and moved the landing gear aft slightly, but I really didn't like the look of all of the landing gear blocks made of different sizes and placed at odd angles from each other. so I made a large one-piece landing gear block that will also double as a cabin floor. 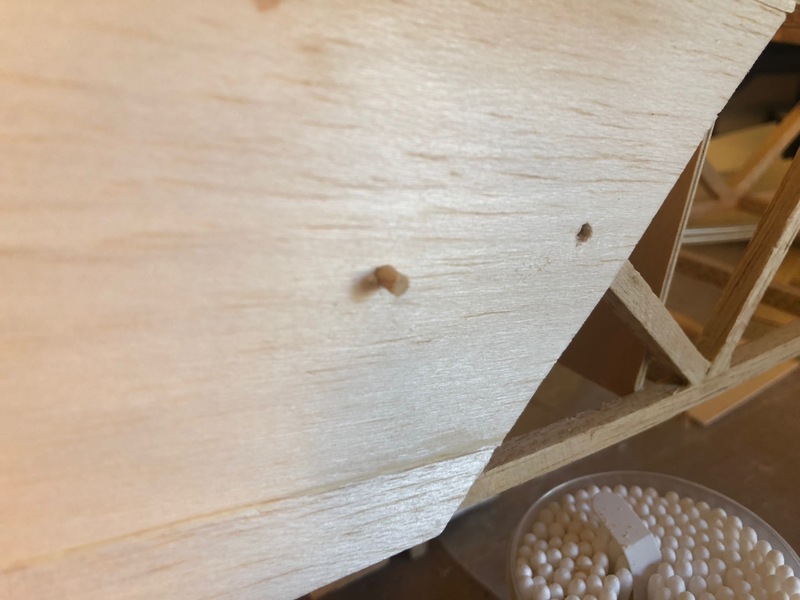 This not only makes the installation look a lot cleaner, but I was also able to keep it relatively lightweight by layering 1mm Ply with 2mm Balsa, and alternating Grain direction. I realize its not hardwood, but by alternating grain direction, I think the strength is there. 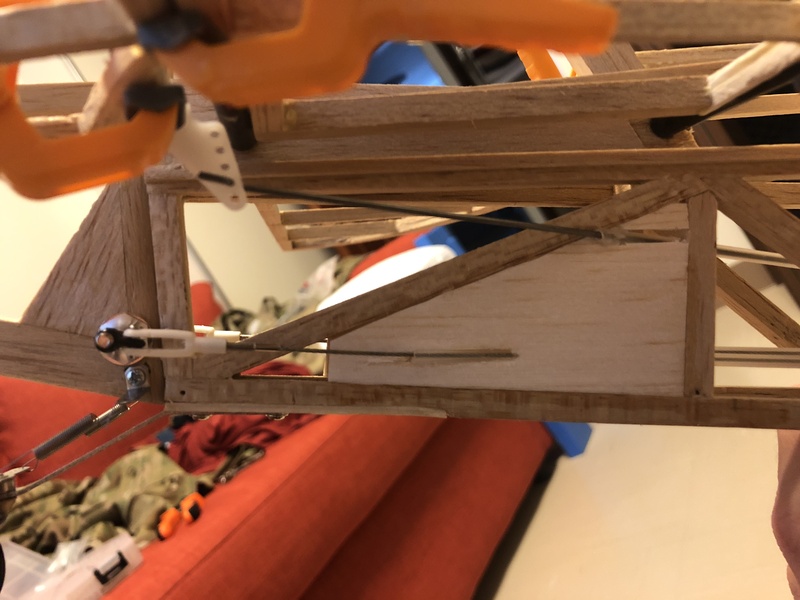 This also allowed me to keep the provisions for the forward float mounts in the correct place, and utilize the same mounting holes for both sets of landing gear. 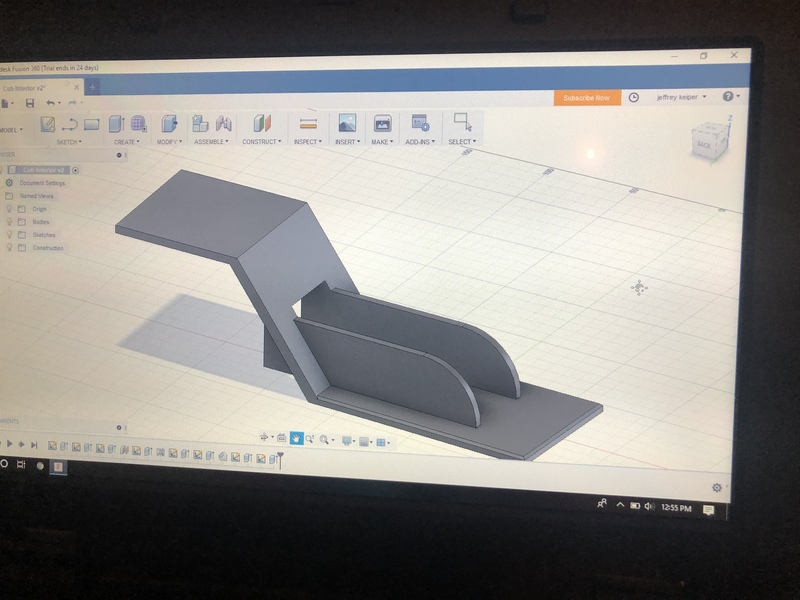 Also a bonus by making it one piece when I do get the floats built it will help with waterproofing the bottom of the cabin. 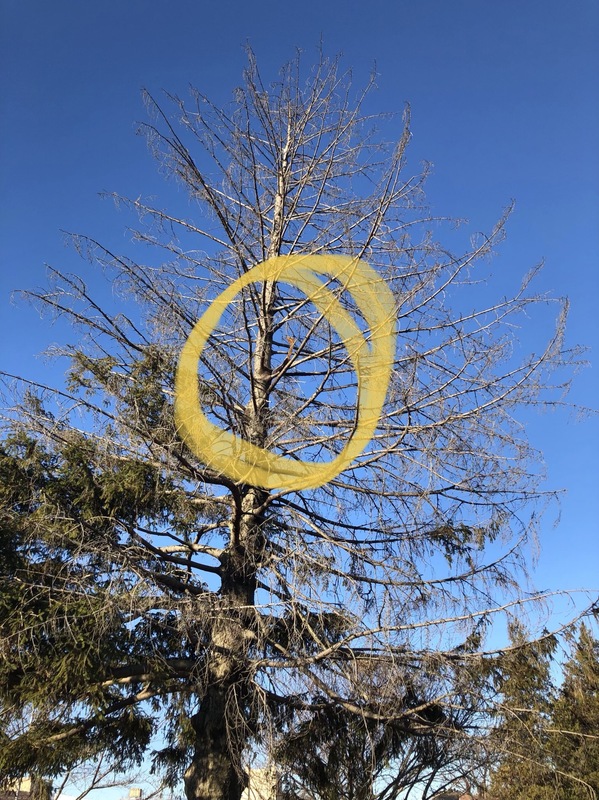 Speaking of cabin, we almost have cabin sides! And heres a Humble Brag picture. Happy New Years! Its been a busy Holiday Season From In law visits to the Birth of my First Baby Boy! 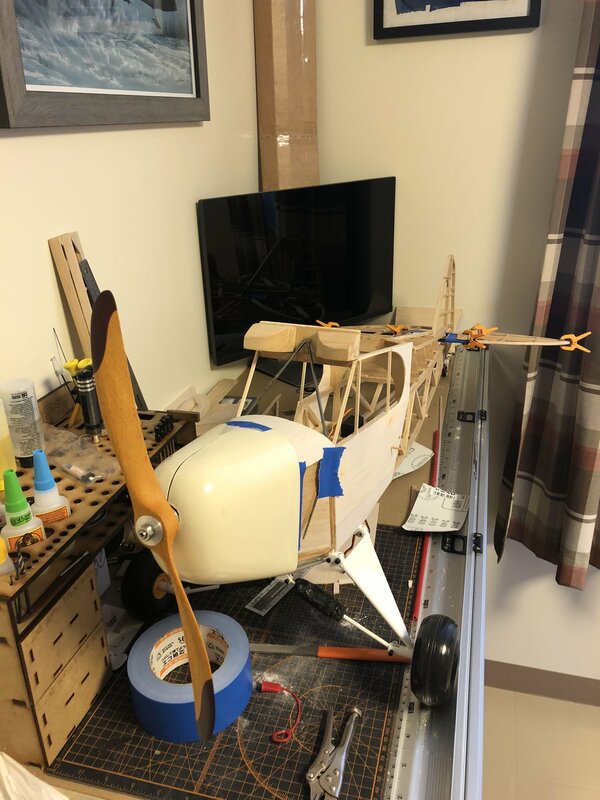 I have had the opportunity to do some work on the cub here and there and finally got a solid couple of hours to work on it today. 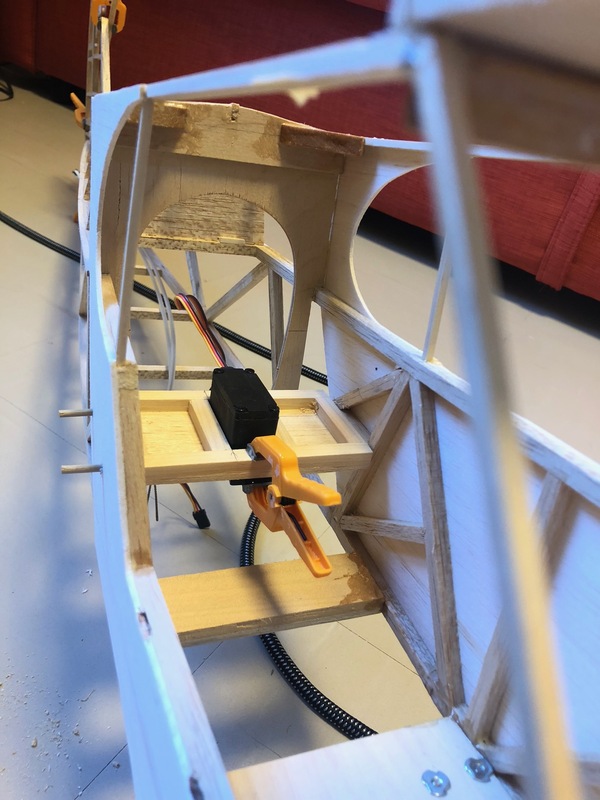 I Focused primarily on the rudder and installing a servo bracket in the cabin. 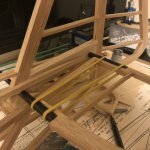 I rigged the Pull-Pull rudder and reinforced the hinge mounts on the rudder. 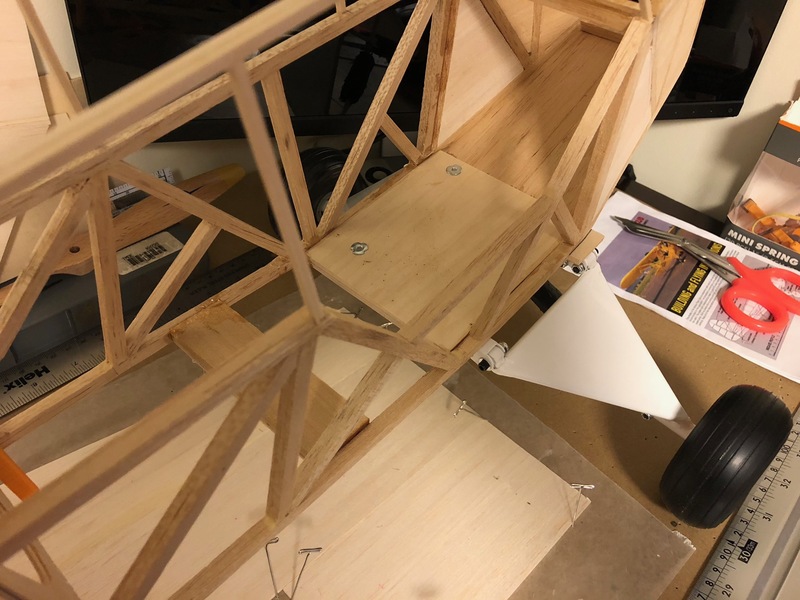 For the rudder tray, I built a frame out of hardwood, and sheeted the visible side, since the servos will be mounted upside down and accessed through the bottom of the cabin this will be the sheeted side. 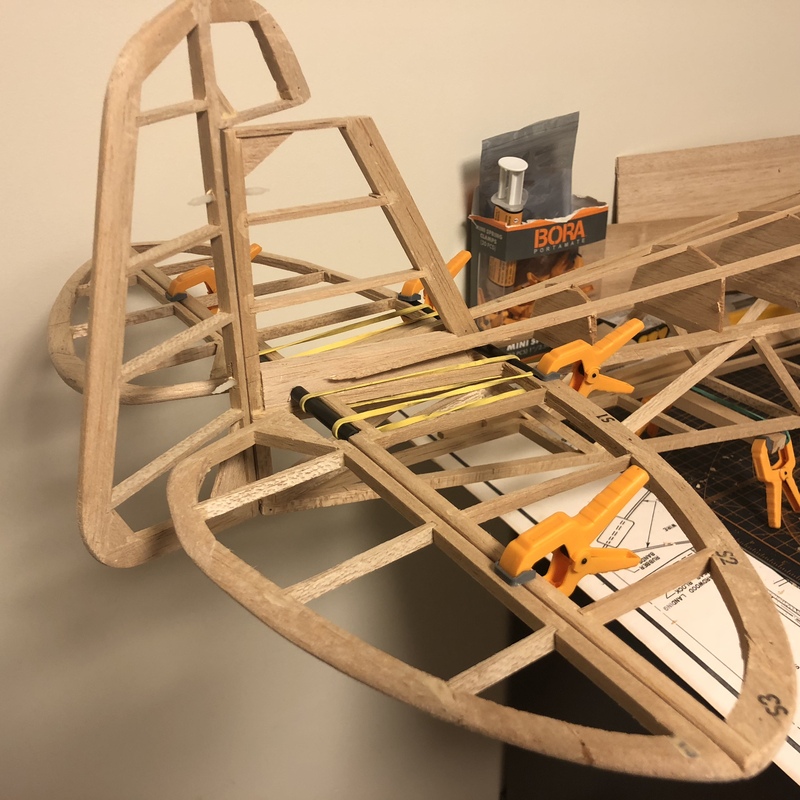 I mocked up the position of the tray and drilled 1/8 holes through the fuselage frame and cabin sheeting, this is for the hardwood dowels that will be glued in place to reinforce the servo tray. 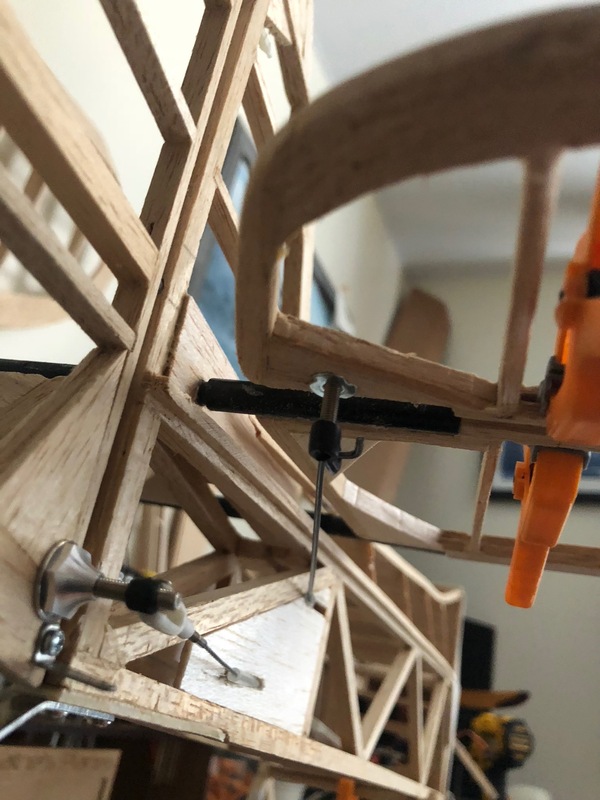 I picked up the great planes medium motor mount and discovered that it will not work for my motor, The large motor mount will not work either. 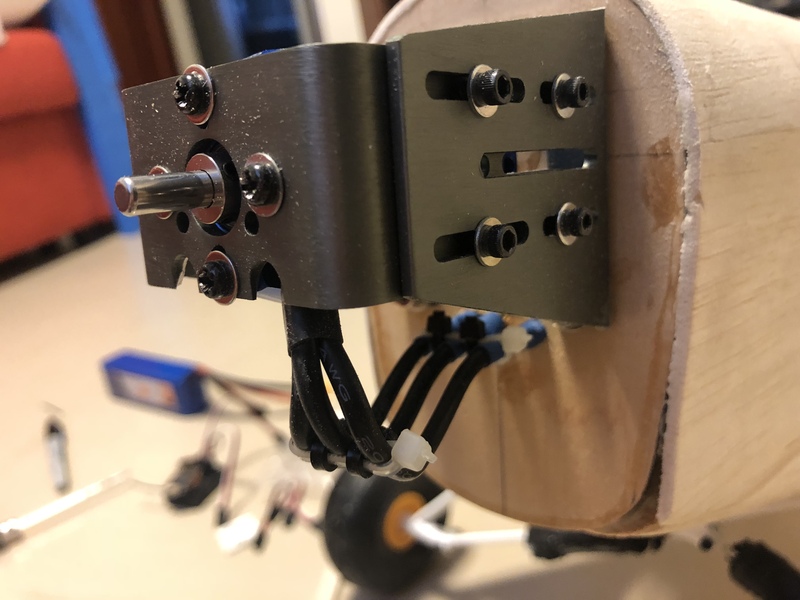 In this case, the pre-drilled motor mounting holes are in the wrong location and there is not enough metal to drill new holes on the diameter that I need. So I formed a new aluminum adaptor for the great planes mount and while it works, I'm not sure I am going to use it. 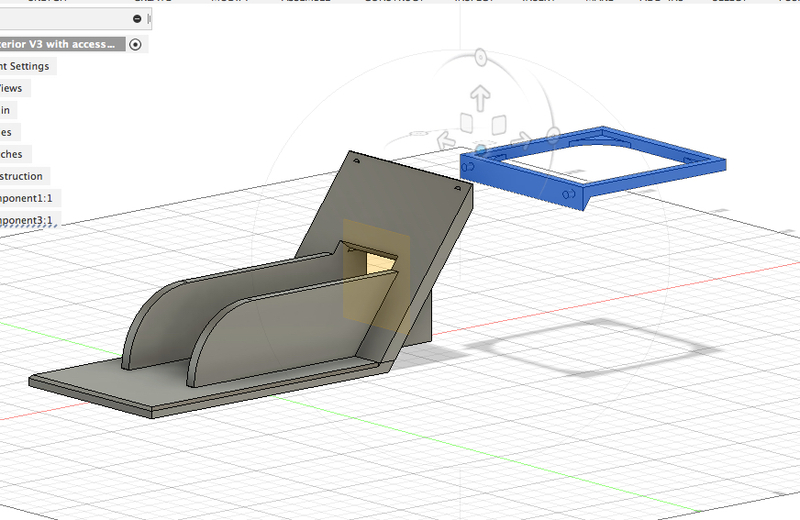 I only need about 3/4" and I can easily make a motor attachment box if this doesn't work out. 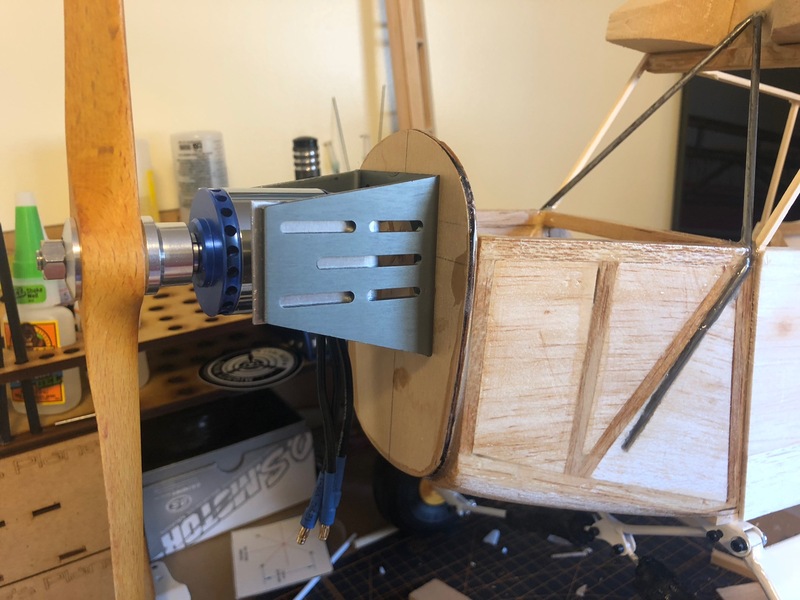 I epoxied the firewall with the correct down angle/ Thrustline so I don't need to worry about making any of those adjustments and I can save the GP mount for the next build. 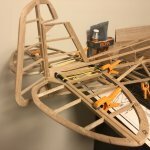 I also finally got the forward formers glued in, and will reinforce them with a 1/8x3/8 Balsa stringer. 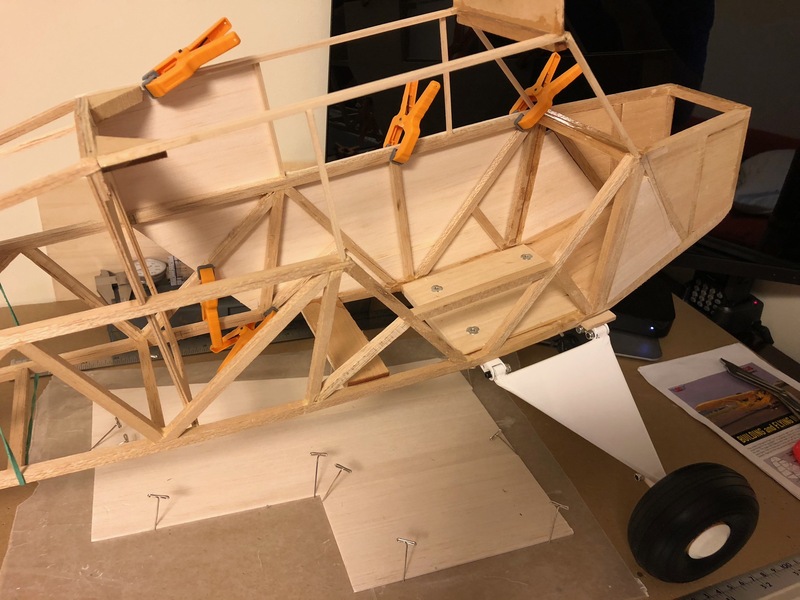 I'm down to the finishing details on the fuselage, I still have some work to do on the wings, but covering should not be too far into the future at this rate. Congrats on the baby boy! Happy New Year! Plane is looking good too. You can mount it either way for the best fit. You sure can, most motors are designed for either way, but may want to double check with the motor manufacture. Also, the GP motor mount is designed for the mounting either way as long as the motor doesnt hit the sides. I have cut and modified GP motor mounts with no issues and great success, I love them. I was struggling here!! Lol the large Mount was too big and the holes didn’t line up on the medium, I selected the go mount on your recommendation actually. I was convinced I’d have to fabricate my own adaptor and after wasting time bending aluminum I realized I could just flip the motor and elongate the holes in stead of making a whole new adaptor. It’s really a pretty versatile product! It made things so much easier. Not to mention the CG is looks to be about perfect. It’s all coming together! Looks good and strong, make sure you use blue Loctite on all the fasteners, you don't want anything coming loose here. Still trucking along, went to mount the horizontal tailfeathers last night and the process is a bit tricky because I am making them removeable so in the process of removing them I broke one side. 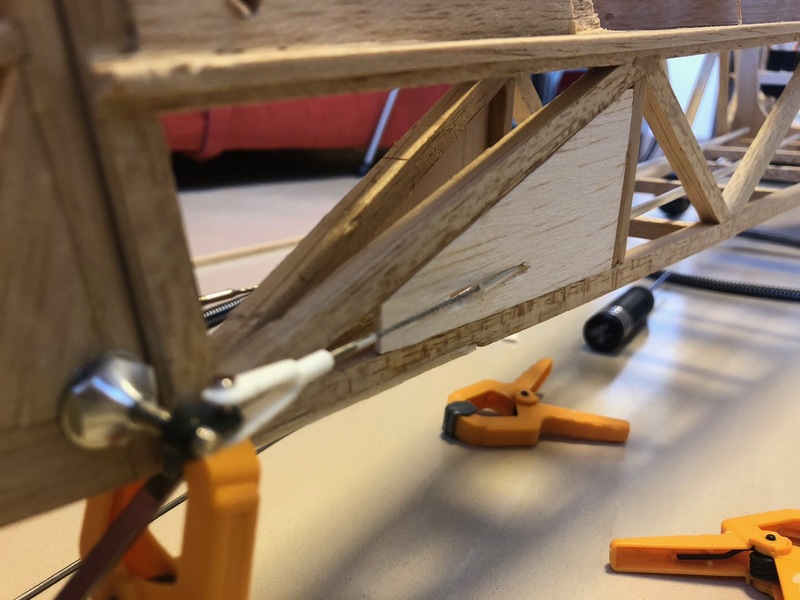 This isn’t wholly unexpected as the balsa in this kit was very old and some of it has turned spongy I had already rebuilt several pieces from the plans so this will be added to those. I did however get one side in place and hinges slotted for the elevator and thus allowed me to figure out elevator hinging and control linkage. 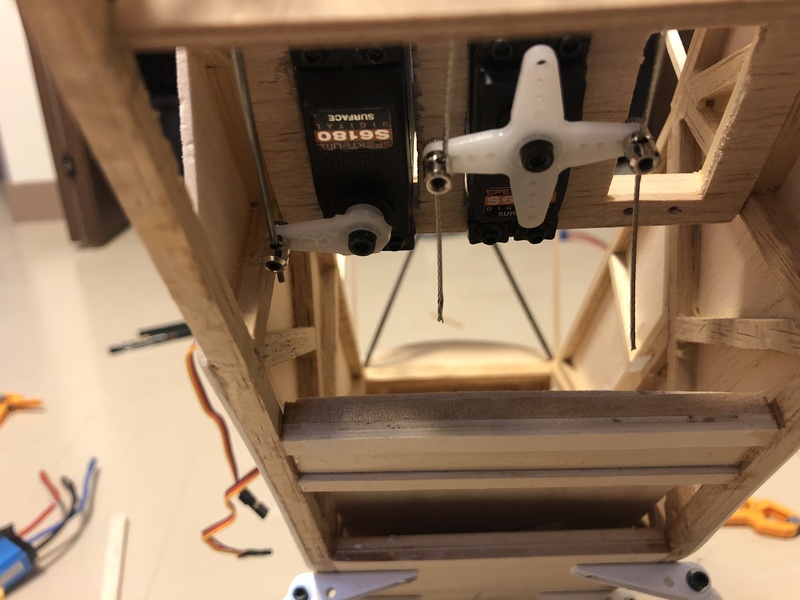 I have also debated running two servos for the elevator, this will help in making the elevators removeable, but mostly the primary motivation is to allow me to install the tail feathers after covering instead of before. The third servo has not yet been installed. The impossible... holes that should have been drilled before assembly... however I had no idea how any of this would end up!! And this mornings tragic end to a beautiful flying morning... lol at least it’s only foam! Hoping to recover it later this evening. 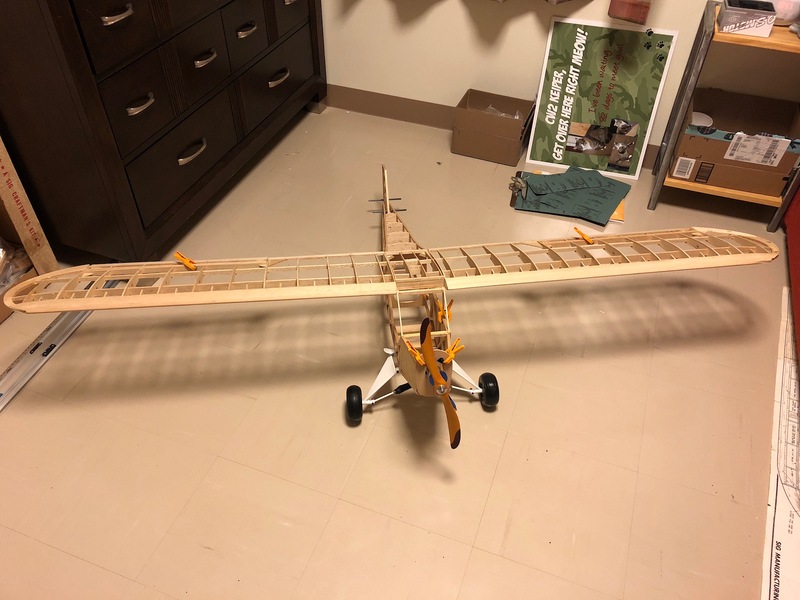 It’s a ft mini trainer with 3 ch wing. Cleaned up the motor wiring a bit as well. Got the Tail Feathers mounted up today. 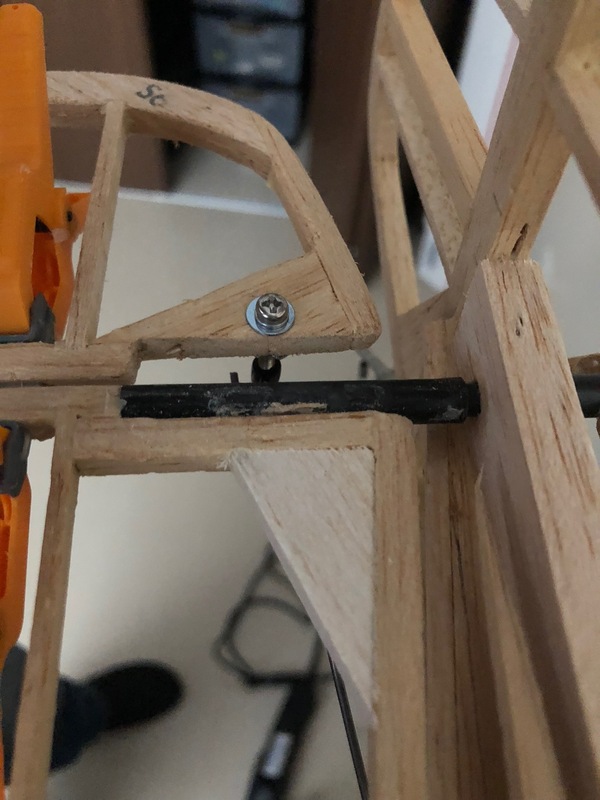 They fit in pretty well with just friction, but I will probably install a set screw in the CF mounting tube just to ensure it doesn't break free. I also made some adjustable control horns, figured I'd try it out, I'm not sure I'm sold on them. 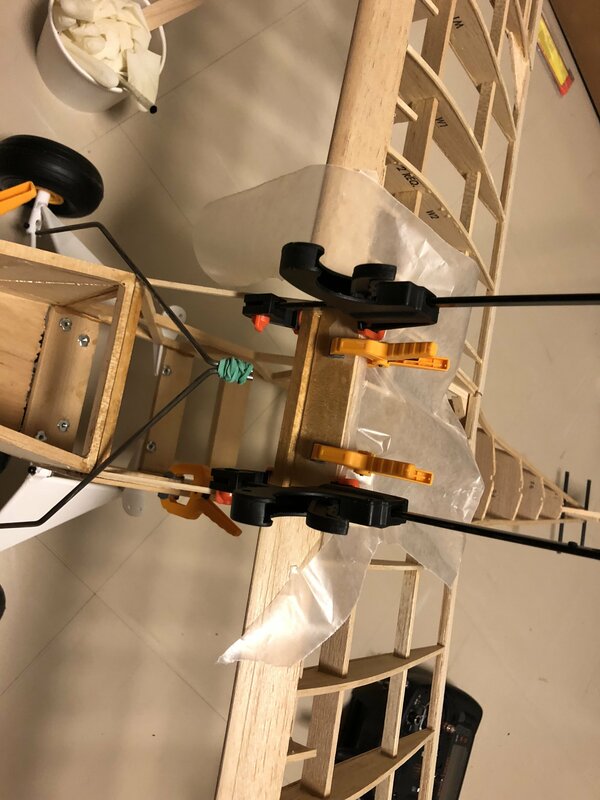 Before covering it weighs 66 oz and the CG is 297mm from the prop shaft, which is just forward of the forward wing spar. So just a little bit forward easy to fix with weight in the back. Quick update, with family in town and a newborn building is slowing down especially with finishing details being the bulk of what I have left! i have been playing with cad software, trying to determine a good layout for the interior that will keep the battery in a good CG location.